Hotel Yoga is the Shangri La Hotel 's resident fitness area, and truly tries to emulate both the luxury of a hotel, and the serenity of a post-yoga-workout endorphin high. 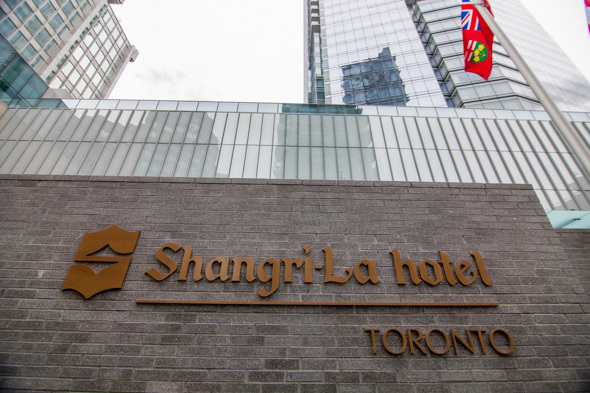 Having underestimated how cold a morning it was, I arrived after a 25-minute bike ride at the Shangri La Hotel on a recent Saturday without much feeling in my extremities. I warmed up immediately upon my entrance into the stunning lobby, which, with a koi pond embedded in the floor, and a massive, roaring fireplace, seemed like a mirage. UPDATE JAN 20, 2014: Hotel Yoga now has a new studio at 367 King St. West upstairs from the Detox Market. They will continue to offer services at the hotel. There to check out the fitness facilities, I following a few people in workout attire into the elevator and up to the hotel's 5th floor. Along with the fitness centre, the 5th floor houses a full service spa and beauty salon. 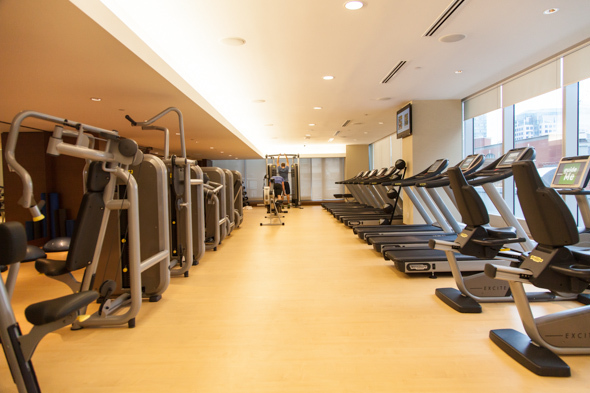 The fitness facility, like the rest of the hotel, is elegant and luxurious, a mix of marble, bamboo and glass surfaces. Alana Hurov, 35, owner of Hotel Yoga, which runs the hotel's fitness programs, showed me around the beautiful space. 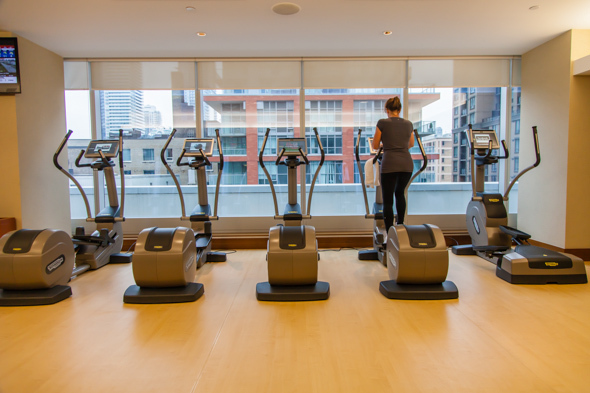 In addition to a generous amount of top-of-the-line cardio and weight equipment, the facility boasts a fitness/yoga studio, and pool area that includes a hot tub, an infrared sauna, pool with light therapy and private cabanas with televisions and comfy seating. Change rooms include all the bells and whistles such as hair dryers, body lotion, and fluffy white towels. Each individual locker is stocked with shampoo, body wash, body lotion, shower cap, loofah, toothbrush, razor and shave cream, comb, emery board, cotton, buds, terrycloth slippers and clean towels. The showers and toilet stalls are completely private, and every surface is immaculate. 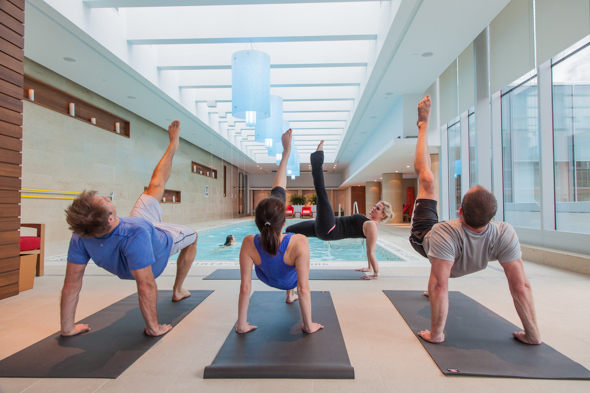 Hotel Yoga functions as a third-party service provider within the hotel and the team offers an array of group fitness classes as well as personal training and nutrition consulting. The company, started by Hurov just a year ago, provides services within the hotel to hotel guests, condo residents, as well as anyone who would like a membership (and is also partnered with other hotels, as well as Niagara on the Lake wineries). Hurov attributes her almost overnight success to her many celebrity connections (due to her past career as a television producer) and work ethic. Nevertheless, she seems down-to-earth and completely unaffected. Annual membership fees (not including classes) are $2,500 for a single, and $3,750 for a couple. However, if that's not within your budget, Hotel Yoga is running a promotion over the coming months for classes--$18 for a class which includes access to change room and steam rooms; $72 for a 4 class pass; $30 for a class which includes access to everything (change room, steam room, pool, hot tub, cabanas, gym, infrared sauna); and $120 for an all-inclusive 4 class pass. Personal training, available for members only, runs $99 per hour, or $85 for 45 minutes. 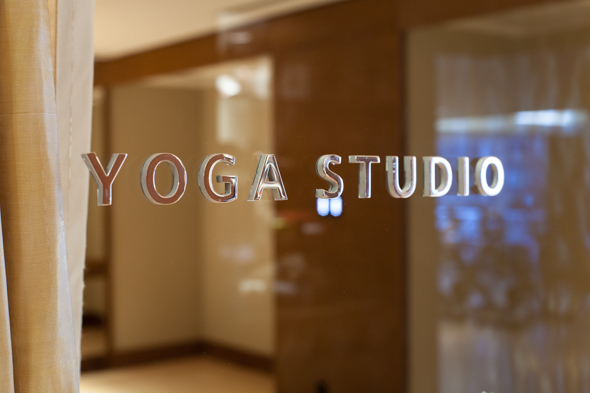 Hotel Yoga will also create classes or offerings for corporate groups or weddings in the hotel (eg. Stretch sessions, wedding day yoga, etc) and in 2013, they will be creating the "Zen Series" which will feature a celebrity athlete, author or well known fitness guru for retreats. The yoga class I attend is taught by Alana herself, and has everything I love in a yoga class: relaxing music, soft lighting, and a sequence that includes both challenging and restorative elements. There are about a dozen or so attendees, one-quarter of which are male. Despite the exclusivity of the facility, the vibe is friendly and non-judgemental. I am instantly comfortable, and so relaxed by the closing meditation that I almost fall asleep. As a nice touch, Alana offers each participant an optional head massage, and covers our foreheads with a warm, damp cloth. I leave the class with such a warm glow that I barely feel the cold on my ride home. 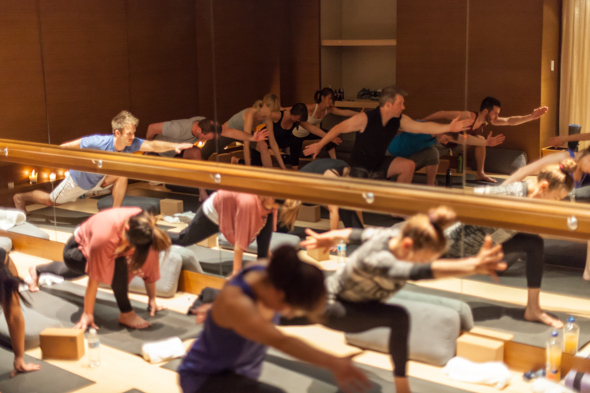 If you live in the area and are thinking of joining a gym in the New Year, run, don't walk, to the Shangri La Hotel and find fitness and bliss with Hotel Yoga. If a membership is not in the cards for you, buy a day pass and treat yourself to a day of fitness and luxury. It just might make the upcoming dreary winter months a bit more bearable. Writing by Erica Berman. Photos by Brian Chambers.